ELG Carbon Fibre specializes in recycled carbon fiber materials. 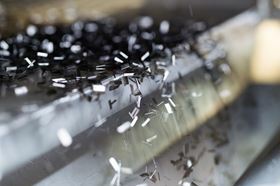 ELG Carbon Fibre, which specializes in recycled carbon fiber materials, has received ISO 14001:2015 environment management system accreditation and maintained their BS EN ISO 9001:2015 and EN 9100:2018 quality management system accreditations across all materials, products, processes and services. To meet the criteria for ISO 14001:2015, ELG was required to identify all environmental aspects, associated impacts, and what measures must be implemented to control these factors within the organisation. ELG also compiled a Legal Register that included an Environmental Policy highlighting the company’s sustainability objectives. ‘ELG is a processor and recycler of a valuable raw material so sustainability is part of our DNA,’ said Frazer Barnes, MD of ELG Carbon Fibre.